AUGUSTA, Ga. (Aug. 28, 2017) – The American Society of Hematology will honor Dr. Betty S. Pace, interim chief of the Division of Pediatric Hematology/Oncology at the Medical College of Georgia at Augusta University, with its inaugural Award for Leadership in Promoting Diversity for her extraordinary commitment to diversity and inclusion in hematology. The award was established by ASH to recognize hematologists who have supported the development of an inclusive hematology workforce, encouraged the career development of underrepresented minority trainees, or made a commitment to inclusiveness through contributions in support of ASH's mission. ASH President Dr. Kenneth C. Anderson will present the award to Pace Dec. 10, during the 59th ASH Annual Meeting and Exposition in Atlanta. Pace, a prominent national sickle cell disease researcher, is the Francis J. Tedesco Distinguished Chair and director the Pediatric Sickle Cell Program at MCG and AU, also serves as a professor of pediatrics, biochemistry and molecular biology, and graduate studies at the university. She has dedicated significant time to mentoring and promoting diversity in hematology research for more than two decades. From early in her career, she worked to attract minority students from high schools and undergraduate programs to biomedical research. Among the 80 individuals that Pace has trained personally during her academic career, 45 percent have been underrepresented minorities. Additionally, 60 percent of her publications have included minority trainees and collaborators. 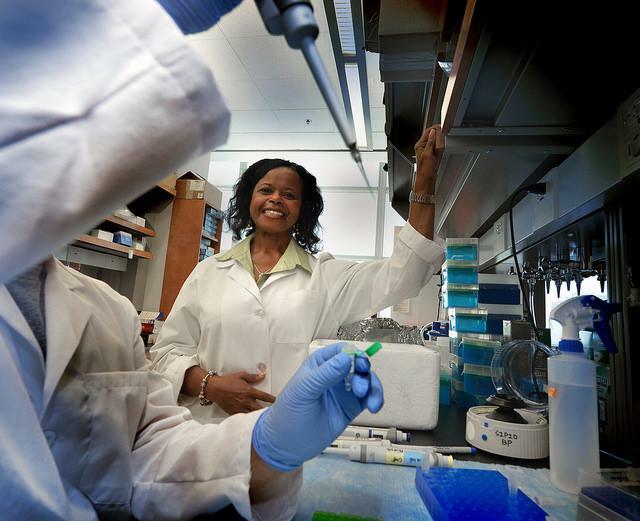 At the University of Texas at Dallas, where she worked from 2003-10, Pace created a talent pipeline of minority students who received training in her laboratory. To further enhance training and mentoring opportunities for underrepresented minority junior faculty members, Pace received grant funding from the National Heart, Lung and Blood Institute in 2006 to establish the Summer Institute Program to Increase Diversity for those studying red blood cell disorders. Later, she continued the program, renamed Programs to Increase Diversity of Individuals Engaged in Health-related Research (PRIDE), at MCG and AU. These two programs have provided mentoring, education, hands-on laboratory training, and grant-writing workshops to 76 junior faculty, including a significant number of hematologists from academic institutions across the country. Pace has served as a member of the ASH Committee on Promoting Diversity, which is responsible for advising ASH in its efforts to improve minority recruitment in hematology research and practice in the United States and Canada. She has also served as a mentor for the Minority Medical Student Award Program, which was designed to introduce minority medical students to hematology. Pace has previously received the Lifetime Diversity Champion Award from the University of Texas at Dallas and MCG's 2013 Basic Science Research Award. Most recently, she was honored during the Black History Month Faculty Recognition Celebration at Augusta University. "Dr. Pace has spent a lifetime supporting the development of an inclusive hematology workforce and has encouraged the career development of a multitude of underrepresented minority trainees," said ASH President Anderson, of the Lebow Institute for Myeloma Therapeutics and Jerome Lipper Myeloma Center at Dana-Farber Cancer Institute in Boston. "It is my great pleasure to recognize her with the inaugural ASH Leadership in Promoting Diversity Award." The American Society of Hematology is the world's largest professional society of hematologists dedicated to furthering the understanding, diagnosis, treatment, and prevention of disorders affecting the blood. For more than 50 years, the society has led the development of hematology as a discipline by promoting research, patient care, education, training and advocacy in hematology. ASH publishes Blood, the most cited peer-reviewed publication in the field. Last year, ASH launched Blood Advances an online, peer-reviewed open-access journal.